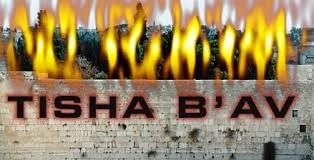 Today is the Nine of the Jewish month of Av, or Tisha B'av--the saddest day in the Jewish year. Thousands of years ago, the First and Second Temples were both destroyed on this day. The Bar Kochba rebellion failed on this day, as well. Many years later, when Spain expelled its Jews in 1492, the date the Jews had to be finally out of the country was....you guessed it, the Ninth of Av. And there are more sad events, too many to mention here. Today, the situation on the Ninth of Av doesn't feel too different, as Israel buries its fallen soldiers and we wait and pray for this war to be over, knowing that it's just one in a long, bloody history--a battle that will almost certainly not end in my lifetime, or my children's. On Tisha B'av, we all act like mourners. We don't shower, eat or drink (unless needed for health reasons). We don't put on makeup. We sit on the floor. We take the time to look at the darker, sadder parts of life, the ones that we often want to ignore. Intense emotions are hard to engage with sometimes: they require stepping away from the computer, putting down the to do list, and making ourselves vulnerable. But if we don't really engage in grief and pain, than we can't really feel joy--and what a waste of our lives that would be! So today, I'm taking time to sink into the pain. The grief, and then later, the joy. How do YOU engage in the harder and sadder aspects of life? P.S.--If you're worried, this blog is not turning into a political and religious one. But it's about me and what I'm thinking, and lately this is what's been on my mind. And as always, I care so much about hearing what YOU have to say. Thanks so much for sharing this, it is always interesting seeing how other countries/religions etc work. It was the centenary of World War One over in the UK on the 4th! Nothing like this was done though. How do you observe this with the kids, Keshet? I find your posts so interesting! Keep them up! canada goose norge There canada goose norge nettbutikk are a lot of corpses, most herds of wild beasts. Those animals out to eat carrion, mutilated, canada goose norge torn everywhere. With vomiting cheap feeling, and quickly shifted his gaze, immediately cast canada goose norge teleport, Kjøp Canada Goose jakke Jiangzhou returned to the school door. The time is 8:00, morning reading class. The canada goose norge teachers are accustomed aa cheap late, is too lazy to manage. cheap too used to this wild, defiant canada goose norge in the classroom, of course, canada goose norge did not forget the horse itch scratched. .